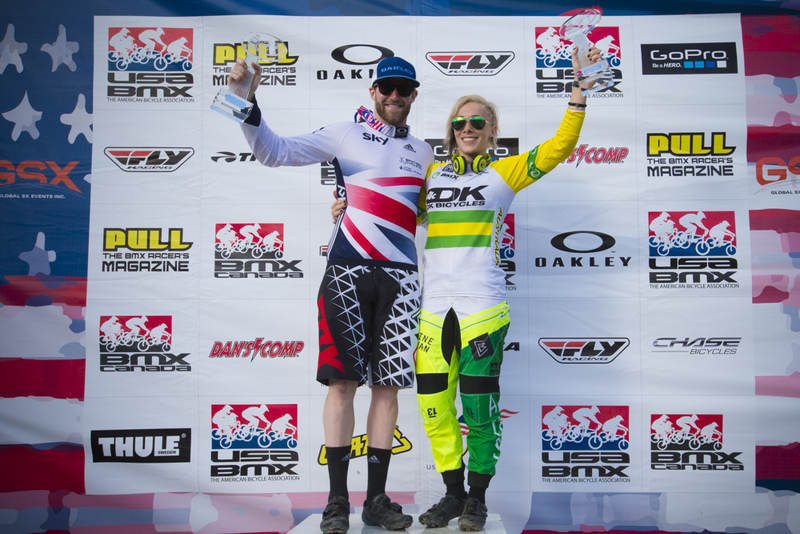 Phillips and Buchanan grab 2014 overall World Cup titles. Chula Vista, California. Saturday 27 September 2014. 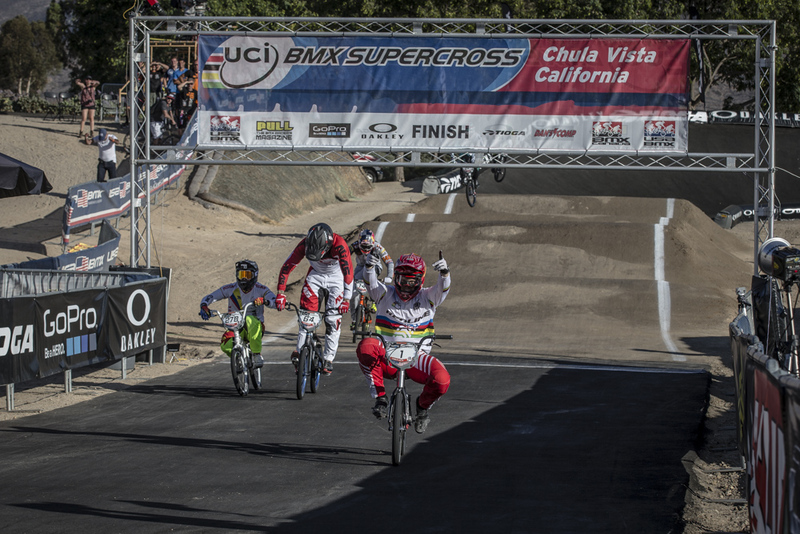 The last race of the 2014 UCI BMX Supercross World Cup is done and dusted and it couldn’t have happened in a better way. In front of the eyes of the pioneers of the sport it was Sam Willoughby (AUS) and Mariana Pajon (COL) who grabbed the wins at the Olympic Training Center in Chula Vista, California. The overall titles went to Liam Phillips (GBR) and Caroline Buchanan (AUS) who came to the final race as series leaders. The title for Liam Phillips did not come easy. In fact, Liam did not make it to the main event. In the quarter finals the Brit did not make it through. “I was in lane two next to Corben Sharrah (USA) who had a great start as did David Herman (USA) on the outside and got into some traffic going into turn one. Then Kyle Evans (GBR) overshot the first jump on the second straight and crashed, which I avoided together with Sylvain Andre (FRA). We then touched and I went down and that was it.” said Phillips. At that moment the series leader panicked a little as title contender Anthony Dean (AUS) was still in the race. Liam: “The whole objective coming into this race was to win the overall title and end the race the same way I’ve ridden the whole season and end the season with a podium.” That plan was over when Phillips was eliminated of the race and Dean transfered to the semi final. Calculations were made quickly and for the Australian to win the title he had to win the race. Pressure was on and got to Dean in the semi final where the race stopped for him after a hard fought battle with Barry Nobles (USA) on the rhythm session. A relief for Liam Phillips because Anthony’s crash meant the 2014 overall title was his. The Men final was won by Australian Sam Willoughby who had been ill all week leading up to the race. The goal was still to win the race and Sam was delighted he pulled it off. Willoughby: “This track is so long and challenging which adds another variable to it. This track is as big as it gets, it’s so gnarly but it’s what we train for.” Second place was for local Nic Long (USA) who scored his first World Cup podium of 2014 on his home track. Third place went to an emotional Carlos Ramirez (COL). 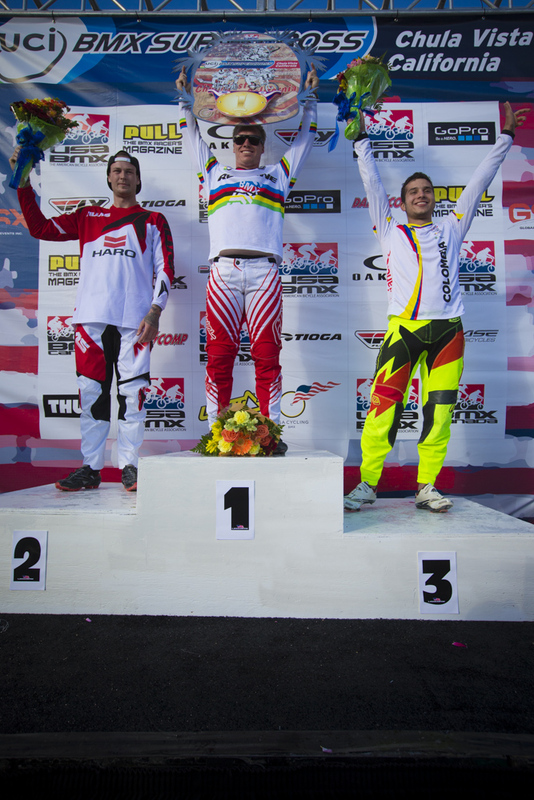 It was his first World Cup Supercross podium. 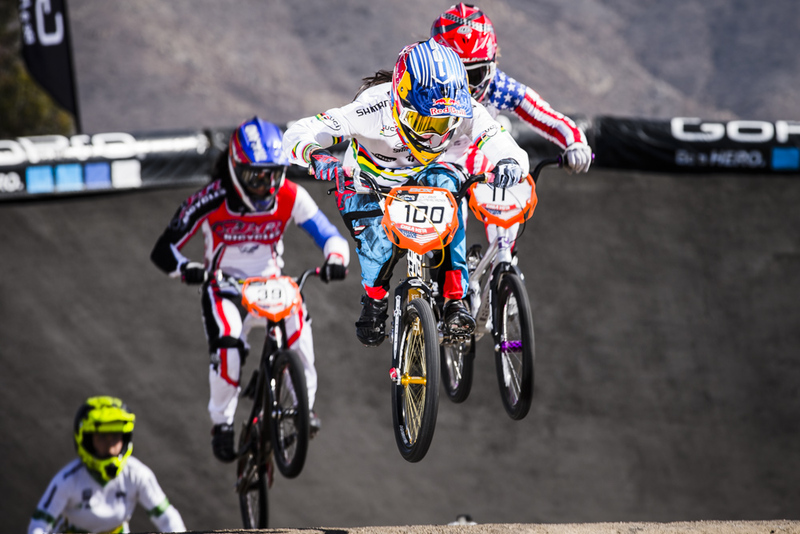 The level of the women riding BMX supercross is incredible. The progression they’ve made over the years is truely amazing. America’s Alise Post’s comeback after an early season injury in nothing short of impressive and she got in the lead together with Mariana Pajon going into the first turn. On the second straight the battle continued as points leader Caroline Buchanan sneaked into third place. The rhythm section is Mariana’s favourite part of the track and that’s where she took off from Post. Alise actually lost momentum in the rollers and Buchanan passed her for second place. The hug between race winner Pajon and overall World Cup winner Buchanan was a nice way to end a great season.